Laundry rooms are an important part of the house for home buyers, but this space can often get overlooked when it comes to staging. After all, how much can you do to spruce up a washer & dryer, particularly if the laundry room is only a small room or even inside a closet? But regardless of how much space your listing has, you’d be amazed at what a little staging can do to make buyers consider the laundry room a more inviting space and not just a dreaded space for chores. Add storage: There are plenty of options, from cabinets, shelves, hanging rods, baskets, to drawers under the washer and dryer. Storage can be an important part of making a laundry room more functional and less cluttered. Home owners will want a place to tuck away all of those laundry supplies and a the space that leaves an impression as clean as the clothes coming out of the washer and dryer. Create a folding station: Find a place for a countertop, such as over cabinets or even a countertop over the washer and dryer. If the room is large enough, you could even do a table or folding station island in the middle. If it’s smaller, a small table may suffice. But have an area devoted to folding clothes or at least big enough to store a laundry basket, besides the floor. 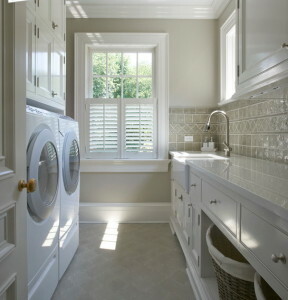 Enhance with color: Warm the laundry room up with a comforting color on the walls, such as a soft blue. Or, add a colorful rug or even a fun print – such as in damask — to an ironing board cover. If your listing’s laundry room is in a closet, add shelves above the washer and dryer and use wallpaper behind the shelves to dress it up, Turk suggests.